Ponderosa Pines Bunkhouse and Stables, Lead, SD. 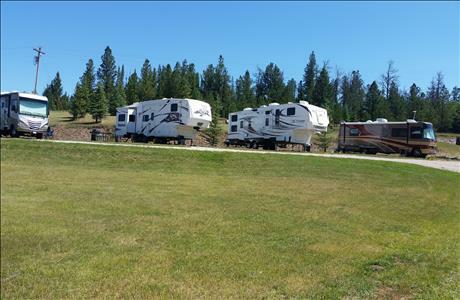 RV sites, tend sites, and bunkhouses. Shower house, laundry, tent rentals. Camping cabins have refrigerator, microwave, electric skillet, coffee pot, TV, and WiFi. Pet friendly. Physical Location: 21981 North Rochford Road, Lead, SD 57754 Driving Directions: Take exist 17 from I-90 - South on Hwy 85. Hwy 85 through Deadwood, Central City and Lead. After driving through Lead continue on Hwy 85 South 3 mi. - you will see the Presidents Park on your right, Turn left after the huge bust of Abraham Lincoln. This left is Rochford Road. Continue on Rochford Road for 7.1 miles. Carsten Cottages will be on your right. Cancellations made 14 days or more prior to arrival date, will be charged $50 cancellation fee. Cancellations made within 14 days of the arrival date, are nonrefundable. All Service Fees are non refundable Holiday & Special Event Cancellation Policy Reservations cancelled 14 days or more prior to arrival date will be charged a $25 cancellation fee plus one nights deposit. Reservations cancelled within 14 days of arrival date are nonrefundable. All Service Fees are non refundable. Equivalent of one nights rental is due at the time of booking. Final payment is due 14 days prior to arrival and will automatically be charged to your credit card 14 days before arrival. 1 p.m. MT - Guests name will be left on the outside of the cottage and the key will be inside. Owner will call guest a few days before arrival with instructions. This is a pet-friendly property. Animals must not be left alone, and owners are responsible for any damages. The nonrefundable fee is $5 for a small pet, $8 for a medium pet, and $12 for a large pet, per night. KOOL DEADWOOD NIGHTS and STURGIS MOTORCYCLE RALLY DEPOSIT: This deposit policy is in effect only for Kool Deadwood Nights and Sturgis Motorcycle Rally. Equivalent of 50% is due at the time of booking. Final payment is due May 1st and will automatically be charged to your credit card. Your reservation is confirmed at the time of booking. Please sign and return the attached contract from BLACK HILLS CENTRAL RESERVATIONS acknowledging our policies. KOOL DEADWOOD NIGHTS and STURGIS MOTORCYCLE RALLY CANCELLATION: This cancellation policy is only in effect for Kool Deadwood Nights and Sturgis Motorcycle Rally. If a reservation is cancelled prior to May 1st, the 50% is non-refundable. If a reservation is cancelled after May 1st, total reservation is non-refundable.